BELLEVILLE – The Repeat Offender Parole Enforcement Squad has issued a warrant for a convicted killer who breached his parole and is known to frequent the Belleville area. A Canada-wide warrant has been issued for Lyle Ridgewell after breaking his parole for second-degree murder. Photo courtesy of the OPP. 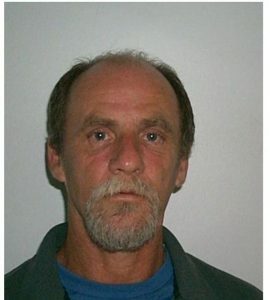 The OPP is asking for the public’s help in locating 60-year-old Lyle Ridgewell. He is on parole for life after serving time for second-degree murder. Ridgewell is five feet, six inches tall and 143 pounds. Police say he may have shaved his head and beard recently. OPP said he is also known to frequent the Peterborough, Cobourg and Kingston areas. Anyone in contact with Ridgewell or knows his whereabouts is asked to call the Provincial Repeat Offenders Parole Enforcement Squad at 416-808-5900 or Crime Stoppers 1-800-222-8477 or call 9-1-1.